Howdy, lovers of all techies smart! Today we have a special treat for you to light up your post-festive mood, and it’s called Bolt. A fresh addition to the growing smart bulb market, Bolt was recently introduced by popular wearables brand Misfit at CES 2015 as a smart light bulb that can do quite a few things no other bulb on the market can take pride in. So, what’s so special about Bolt? Scroll down to learn more. Bold and handsome design-wise, Misfit Bolt LED bulb can output the same amount of light as a regular 60-watt bulb, i.e. around 800 lumens of warm white light on just 13 watts of power. However, unlike most traditional bulbs out there, Bolt can also change colors (a feature so far seen only in Philips Hue bulbs) and create a number of different light schemes. 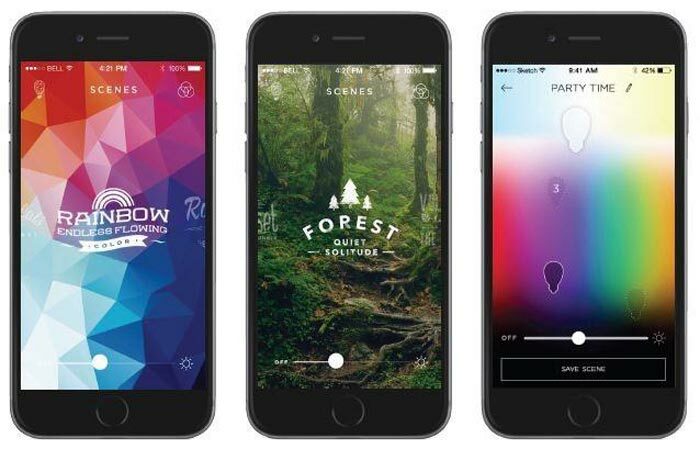 All you need to do in order to change colors and adjust light patterns produced by your Bolt bulb is simply tap Misfit’s companion application called Misfit Home (available for both Android and iOS devices) and pick the light tone or color scheme you like best out of millions of preset color combos. The Bolt light settings can also be accessed from Logitech’s Harmony Home remote and application, so you shouldn’t worry too much about the color of your house lights in case you manage to misplace your Misfit wearable somewhere on the premises. 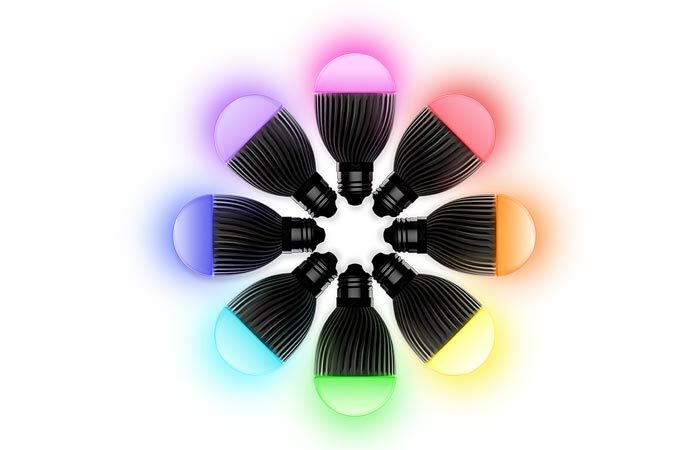 If you’re always looking for greater versatility in your smart gadgets and gizmos, you can also use multiple Bolt bulbs to create a unique atmosphere and light mood in your room, but that’s not all: this smart little wirelessly controlled bulb is also compatible with a number of Misfit wearables like Shine, Flash and Beddit sleep tracker, allowing the user to custom-configure the settings and wake up to a simulated sunrise orchestrated when the sleeper is in the lightest sleep stage (the timing and analysis of the individual sleep/wake cycles will be based on data gathered through Misfit’s devices). In addition to the gentle sunrise light, other Bolt preset color schemes include bright day, volcano-scape, forest light and a few others, and you can also use your own photos to create a personalized landscape light pattern. Powered by Cree’s LEDs, Misfit Bolt is 100% eco-friendly and highly efficient in terms of bulb life span and energy consumption. 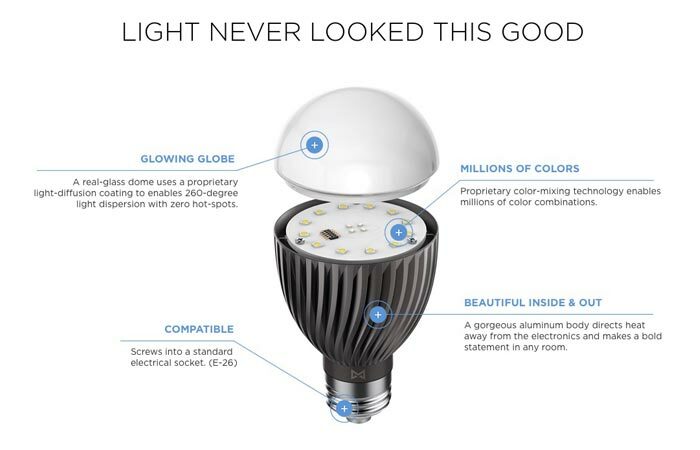 Component-wise, the smart bulb features a glass dome with proprietary light-diffusion coating for wide-angle illumination, and an aluminum body compatible with regular sockets (for added versatility, it can double as a heat sink so no need to worry about hot spots), which means that Bolt doesn’t require a hub to work. So, are you ready to shine bright like a diamond come first morning light? You’d better be, because Misfit Bulb is expected to start shipping by February so make sure you check it out and place your order before.